Started in November 2012, the aim of the MiTRE project was to design and build a small lightweight and most importantly low-cost microturbine generator for use as a range extender for electric vehicles. Its addition to an electric vehicle will reduce the vehicle’s cost (by displacing some of the batteries) whilst offering its owner greater availability and range. The project was worth over £3 million of investment and was a collaborative venture part funded by the TSB (Technology Strategy Board, now Innovate UK). HiETA Technologies led the development of the microturbine recuperator which was key to achieving the target cost and performance of the range extender. The project was led by UK-based vehicle integrator Delta Motorsports, in Silverstone. Traditionally, heat exchange products are often made from thin sheets of material that joined through a process such as brazing, welding, and diffusion bonding. The complexity of the designs makes production both challenging and time-consuming, while the material used for the joining process adds to the overall weight of the part. 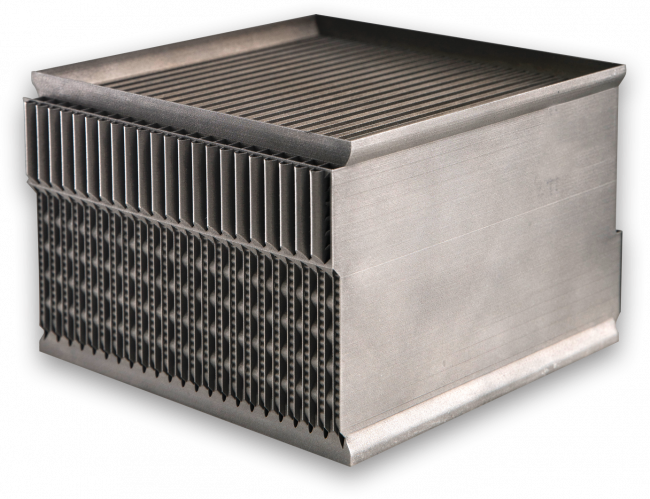 Prior to the work at HiETA, little research had been undertaken into the use of additive manufacturing for the manufacture of heat exchangers. The initial challenges were, therefore, to confirm that AM could successfully generate sufficiently thin walls of the required quality and, then, to produce a complete component with the complexity of a typical heat exchanger. Firstly, HiETA worked closely with Renishaw to develop specific parameter sets for the production of leak-free thin walls in Inconel down to thickness of 150 microns. Both companies produced samples using a variety of settings on the AM250 at both companies’ facilities. The resulting samples were heat treated and then characterised. The test results enabled both companies to confirm the optimum parameters on the machines for thin-walled structures and also allowed HiETA to develop a design guidebook with parameters for heat transfer in heat exchangers manufactured laser powder-bed fusion technology. Having achieved a leak-free integral wall, the next stage was to move to a complete, full-size unit, which could be completed in a reasonable build time. As well as allowing further optimisation of the Renishaw equipment to handle the larger samples, HiETA used these projects to develop an extraction process for removal of excess powder material from the core of heat exchangers. The first result of the partnership between HiETA and Renishaw was to produce the basic data needed to set up the additive manufacturing equipment to produce thin-walled structures successfully and to provide the parameters needed to predict the performance of heat exchangers manufactured with the Renishaw equipment. The thermal transfer and fluid flow data that resulted has been incorporated into the CFD and finite-element analysis programs used by HiETA. These programs can be used for an initial assessment of the likely performance of new component designs and thus confirm that the proposals have the potential to meet the customer’s requirements. However, this performance was achieved with a weight and volume of approximately 30% lower than that of an equivalent part made by conventional methods. 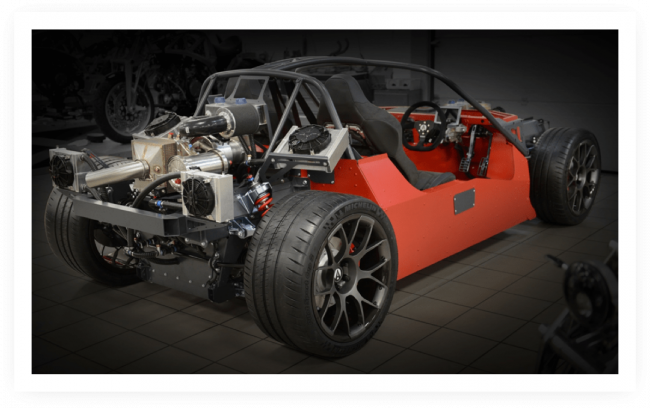 Building on the output of the ‘MiTRE’ project, Delta Motorsport have developed a 35kW version of its range extender to suit the Ariel HiPERCAR. When it came to developing a 35kW version of the MiTRE system for the HiPERCAR, Delta Motorsport turned to HiETA for a solution. In response, HiETA was able to scale-up the original 17kW design to meet the increased power demands of the HiPERCAR application.